1. There are a lot of conversations, articles, and conferences today talking about IoT, yet IoT still seems to be a bit of mysterious concept. When we say IoT, what are we really talking about? That’s a fair a question and one I get asked quite often. I think part of the confusion, or mystery around IoT is that IoT isn’t new, it’s just evolved. Really what we’re talking about is the convergence of Operational Technology (OT) with Information Technology (IT). We’ve had OT for decades. A good example of that is how Utility companies have used Industrial Control Systems (ICS) with sensors and controllers to manage large pieces of physical infrastructure. The distributed monitoring and control isn’t new, but the accessibility of the system, and the information we can get from the monitoring has changed everything. When you take traditional OT and enable it with the Internet (I + OT) you get this powerful combination called IoT. 2. Who should care about IoT? All businesses should care about IoT in that it is an enabler of a greater ability to monitor and respond for almost all areas, whether it be internal optimizations of asset usage through to enhanced customer experience for services and products offered. The reality is that IoT is creating new business models that are shifting competitive dynamics across industries. IoT provides not only the ability to track when and how physical assets are actually used but it allows providers to charge for use. And we haven’t even touched on the value of the combined data from all these connected devices – the benefits to companies who know how to use that data is hard to comprehend. While we typically hear more stories about the consumer’s adoption of personal devices (i.e. fitness bands and connected households ) the potential for business usage is much greater. 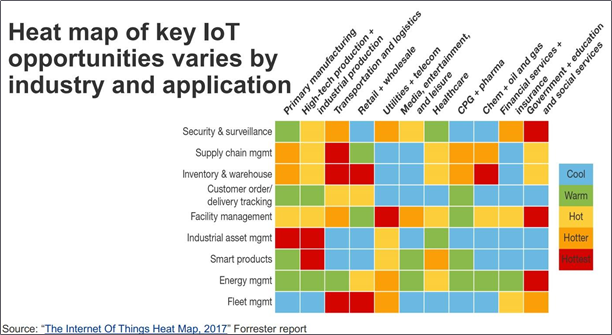 I was recently reading a Forbes article that showed a heat map, by industry, that had use cases for the application of IoT today (“The Internet of Things Heat Map, 2017” Forrester report). There were about eleven industries on the list and without fail all eleven had practical, immediate applications for IoT. Now some were arguably more valuable than others, but the bottom line is that IoT is changing the business landscape and if you’re not actively investing in explorations now you run the risk of falling behind. 3. What’s the biggest risk associated with the IoT? The short answer is Security. The longer answer is that I believe the security question has a few facets. Two of the most significant are security of systems and data privacy. The security of the systems or IoT devices themselves really has to be broken into two groups – legacy IoT and new IoT. The legacy IoT devices, like the ICS systems I mentioned already, were not designed to be connected outside of their strictly isolated network. ICS Security was built and in many ways depended upon the segregation of OT from IT – that is clearly not the model we have today and companies need to be aware that there is a huge risk in using the legacy OT devices in an IoT/connected world. The new IoT landscape presents an entirely new set of security challenges. IoT can scale up the attack surface for any kind of a cyberattack which means that there is an increased risk of a distributed attack on a lot of things. When you talk about IoT you have to talk about security. The two should never be decoupled. From a privacy perspective we need to ask a familiar set of questions but from a totally new perspective. Who owns the data? Is it your data? Is it my data? How much of it can be used without your permission and how do we get your permission? What benefits are offered to a provider of data that they agree to? And how do you ensure that you are in compliance with the right regulations? We are talking about a tremendous amount of data being available from devices in your home or on your body and we’re talking about that data being captured and transmitted back. We need to seriously examine the impact on privacy of consumers, and businesses alike. 4. How do companies get ready? 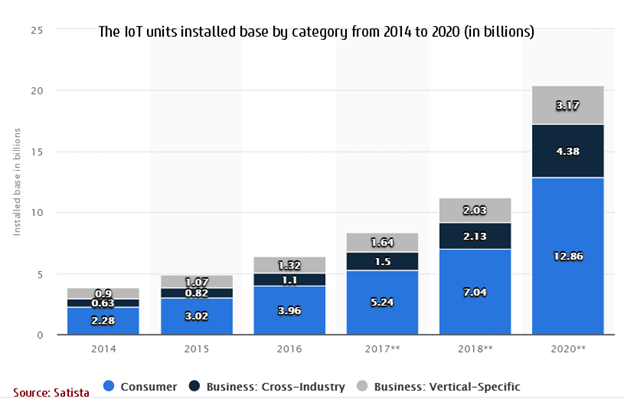 By 2020 there will be 20 Billion IoT devices. Just think about that stat for a minute. 2020 is less than 2 years away. In less than 2 years, there will be three internet connected devices for every man, woman, and child on the planet. And many of those devices will be talking not just to the cloud, but directly with other devices. IoT is now an established market. It’s here now, and companies all over the world are benefiting from it. 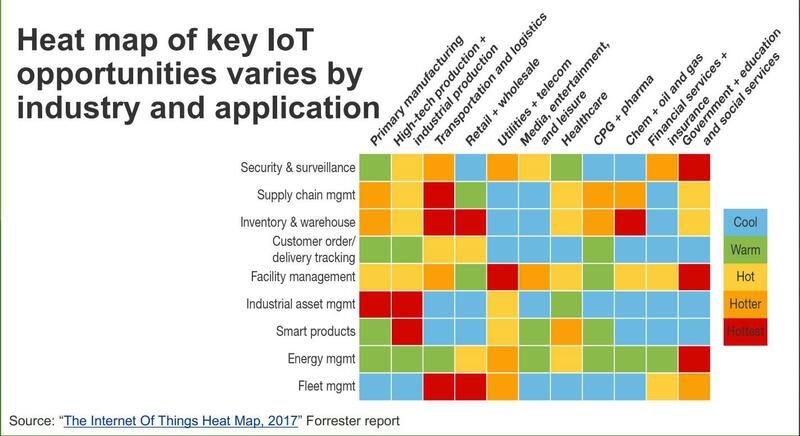 You need to start unpacking IoT for your companies today. In terms of getting ready, companies need to understand that IoT is a unique discipline. 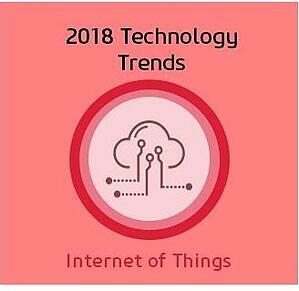 Despite advances in the technology and what some of the material you might read from IoT vendors say – IoT is a challenging area and is architecturally hard. IoT is massively distributed and you are no longer dealing with the near infinite capacity/computing power of current Cloud Computing architectures. In fact you are dealing with many of the constraints of old that I grew up with, such as low memory and low compute on devices that are poorly connected, operating in remote and harsh environments. This requires skills that many companies don’t have in house any more. You need to start staffing IoT developers, or find a partner that does, who truly understands how to deal with the minimal environment, inherent constraints, while fully embracing Security architectures. I often call this the “The Curse of Plenty vs the Curse of Constraint” – you have to understand both to be successful today. 5. What’s the one piece of advice for a business leader interested in the Internet of Things? I’d start by asking a different question I think. I’d start by asking what business problems are facing your organization? Where are you experiencing pain? If you could have more data could you address those problems more effectively. If the answer is ‘yes’, then I’d shift the conversation to how IoT can help. IoT can be an amazing opportunity for many companies today – but its value diminishes if it’s not directed at a problem around data, and customer experience. Has your company began looking into how IoT can help you accomplish your goals? If you have any questions feel free to reach out to me directly.